Made in usa stand mixer P OURING SHEILD NOT INCLUDED WITH REFURBISHED MIXERS. KitchenAid's Artisan stand mixer is a substantial piece of equipment: 325 watts of mixing power make child's play of creaming butter, kneading dough, and whipping cream. The kid in you will appreciate how quick and easy it is to mix up a batch of cookie dough. This model comes with three attachments: a flat beater for making batter, meat loaf, and all textures in-between; a wire whip for egg whites, mayonnaise, and more air-infused creations; and a hook for mixing and kneading yeast doughs. This model also includes a 1-piece pouring shield for guiding ingredients to their proper destination, and the bowl itself locks tight to the base. The tilt-back mixer head allows for easy access to bowl and beaters. 325-watt stand mixer with 10 speeds and 67-point planetary mixing action. Solid, all-metal base; 5-quart stainless-steel bowl; 2-piece pouring shield. Uniquely styled tilting head allows clear access to the beater and bowl. Multipurpose attachment hub; flat beater, dough hook, and wire whip included. Measures 14 by 8-2/3 by 14 inches. ATTENTION ALL CUSTOMERS: ALL ELECTRONIC ITEMS ARE 110V. 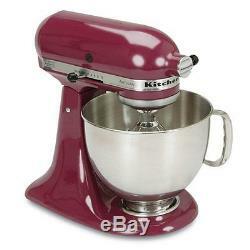 The item "KitchenAid Stand Mixer tilt 5-Quart RK150BY Artisan Boysenberry" is in sale since Wednesday, March 27, 2013. This item is in the category "Home & Garden\Kitchen, Dining & Bar\Small Kitchen Appliances\Countertop Mixers".